An efficient swing can make the game more enjoyable. The golf swing is a mechanical process. You will find greater success with your golf swing if you practice the basic mechanics and then work on repeating those basics the same way for each swing. 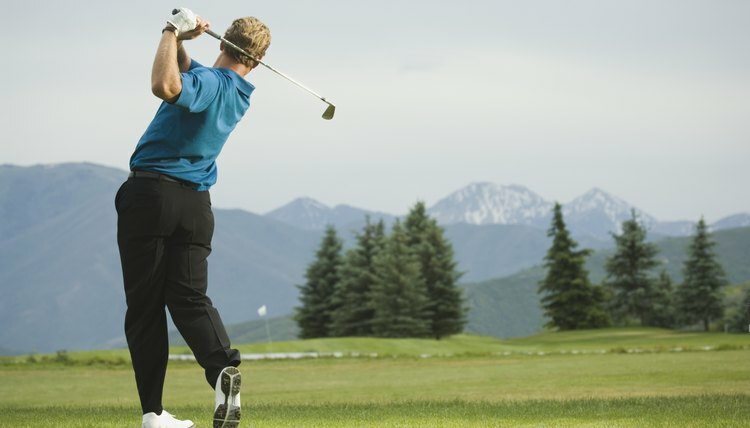 As you become proficient in executing the golf swing basics, you can then start to experiment with the subtle changes to the swing that can change the flight of the ball to match your shot needs. Your feet should line up with your shoulders with your feet spread apart as wide as the width of your shoulders. Your feet and shoulders should be pointing in a straight line toward the target. The best way to work on creating this straight line is to place a club on the ground pointing at the target, then line your feet up even with the club. As long as your shoulders and feet are lined up together, you should now be pointing straight at the target. Take your club and extend your arms out as if you were addressing the ball. Do not bend your back to allow the club head to lay flat on the ground; you should bend at the knees to accomplish this. Your back should remain straight at all times. With your arms extended straight and your knees flexed, you can now establish where the ball should be in your stance. The center of the clubface should line up with the ball. If you have to bend your arms, then you are too close to the ball. If you have to reach to make contact with the ball, then you are too far away. Now that you are lined up square with the target and in the correct stance with knees flexed, the next step is to begin your back swing. The golf swing is a perfect circle from back swing to follow-through, and you maintain this perfect circle by keeping your left arm straight at all times. If you are left-handed, then you would keep your right arm straight. Draw the club back slowly to help establish an even tempo; be certain to keep your left arm straight. When you reach the top of your back swing, your club should be over your head and parallel to the ground. Your hips and knees should rotate back in concert with the club to ensure the proper weight shift. Once the club is parallel with the ground, it is time to begin the down swing. The club should follow the same path in the down swing that it followed in the back swing, and you can ensure this happens by continuing to keep the left arm straight. Make sure your knees and hips are following the club through the down swing to keep the weight shift intact. Do not allow your arm speed to get ahead of your weight shift, as this will cause the ball to go off in a variety of directions. If you are keeping your head down and eye on the ball as you should be, then you should see the club make contact with the ball. If you make contact with the center of the clubface, then the sensation of contact should be minimal. If you make contact with the heel or toe of the clubface, then you will get a sensation at contact that is a stinging sensation in both of your hands. Some players neglect to focus on the follow-through, but the follow-through is an extremely important part of the golf swing. If there is no follow-through, then some of the power is lost in the swing even with proper weight shifting. A lack of follow-through will also cause the ball to slice or hook depending on how the clubface made contact with the ball. A proper follow-through sees the club all the way through the contact point, and then up and over the golfer's shoulder. A good follow-through can increase distance, and it can increase accuracy.